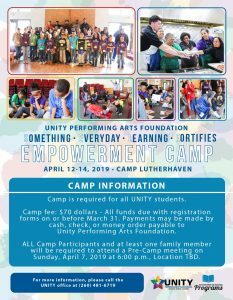 Current UNITY Parents - Please plan to attend our mandatory Pre-Empowerment Camp Meeting on Sunday, April 7, 2019 at 6:00 PM at the Liberal Arts Building (Room 159) on the Campus of PFW. Rhinehart Music Center - Purdue Fort Wayne • 2101 E Coliseum Blvd. Fort Wayne, IN 46805 Please call the UNITY office at 260-481-6719 to report any absences or late arrivals. Friday, April 12 at 5:00 PM - Check-in and Registration Arrive back to Fort Wayne on Sunday around 6:00 PM Day Visitors: There will be a $20 meal fee. Cash or checks only, please. All funds due on or before March 31, 2019. Renaissance Pointe YMCA - 2323 Bowser Ave, Fort Wayne, IN 46803 Please call the UNITY office at 260-481-6719 to report any absences or late arrivals. Click here to view UNITY's monthly calendars http://bit.ly/2y7AKlB For more information about the Voices of Unity Youth Choir, click here. To enroll your child, please call the UNITY office at 260-481-6719 to schedule a registration meeting.